Flick! Carpet Powder is an effective flea & tick treatment for dogs made with natural ingredients you can trust. Flick! 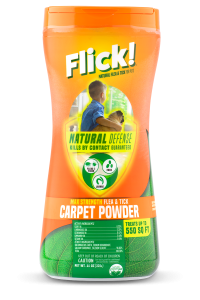 Carpet Powder is easy to use and kills fleas and ticks on carpets and upholstery, and can be used directly on dogs and bedding. The effective flea and tick powder repels fleas and ticks for up to 30 days. Flick! 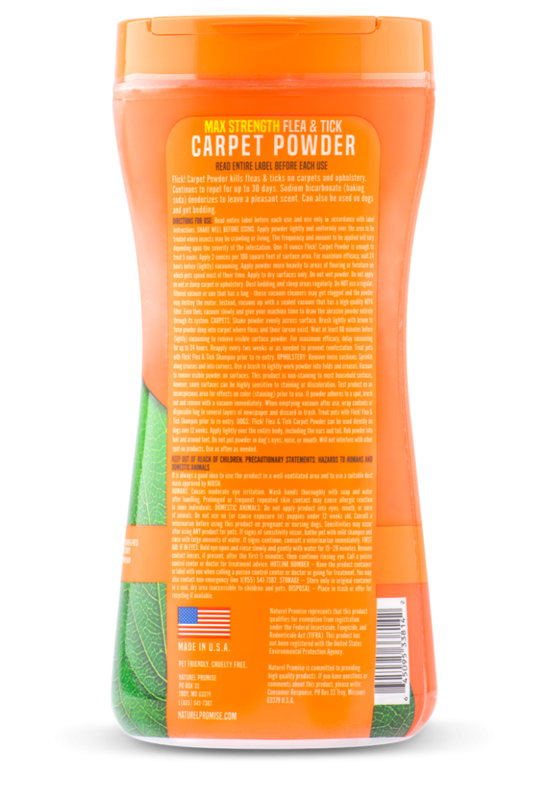 Carpet Powder includes baking soda helping deodorize the carpet and upholstery, leaving a pleasant scent in a room. Active Ingredients: Clove oil, Lemongrass oil, cedarwood oil, cinnamon oil, sesame oil. Other ingredients, Diatomaceous earth, sodium bicarbonate, calcium carbonate, calcium silicate. 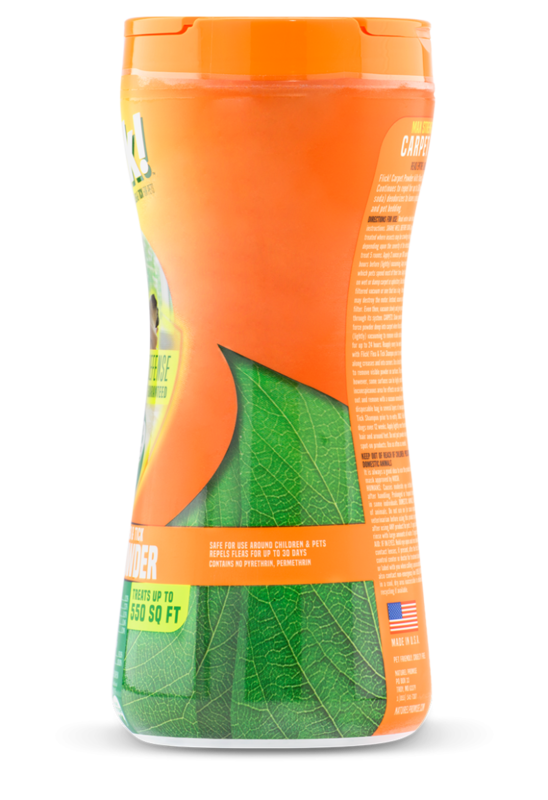 Read entire label before each use and use only in accordance with label instructions. SHAKE WELL BEFORE USING. Apply powder lightly and uniformly over the area to be treated where insects may be crawling or living. The frequency and amount to be applied will vary depending upon the severity of the infestation. One 11 ounce Flick! Carpet Powder is enough to treat 5 rooms. Apply 2 ounces per 100 square feet of surface area. For maximum efficacy, wait 24 hours before (lightly) vacuuming. Apply powder more heavily to areas of flooring of furniture on which pets spend most their time. Apply to dry surfaces only. Do not wet powder. Do not apply on wet or damp carpet or upholstery. Dust bedding and sleep areas regularly. Do NOT use a regular, filtered vacuum or one that has a bag- these vacuum cleaners may get clogged and the powder may destroy the motor. Instead, vacuum up with a sealed vacuum that has a high-quality HEPA filter. Even then, vacuum slowly and give your machine time to draw the abrasive powder entirely through its system. CARPETS: Shake powder evenly across surface. Brush lightly with broom to force powder deep into carpet where fleas and their larvae exist. Wait at least 60 minutes before (lightly) vacuuming to remove visible surface powder. For maximum efficacy, delay vacuuming for up to 25 hours. Reapply every two weeks or as needed to prevent re-infestation. 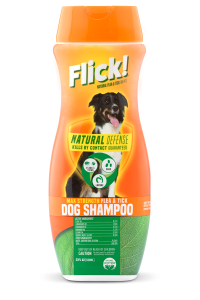 Treat pets with Flick! Flea & Tick Shampoo prior to re-entry. UPHOLSTERY: Remove loose cushions. Sprinkle along creases and into corner. Use a brush to lightly work powder into folds an creases. Vacuum to remove visible powder on surfaces. This product is non-staining to most household surfaces, however, some surfaces can be highly sensitive to staining or discoloration. Test product on an inconspicuous area for effects on color (staining) prior to use. If powder adheres to a spot, brush out and remove with a vacuum immediately. When emptying vacuum after use, wrap contents or disposable bag in several layers of newspaper and discard in trash. 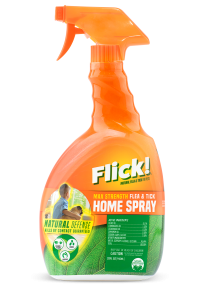 Treat pets with Flick! Flea & Tick Shampoo prior to re-entry. 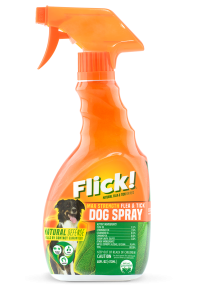 DOGS: Flick! 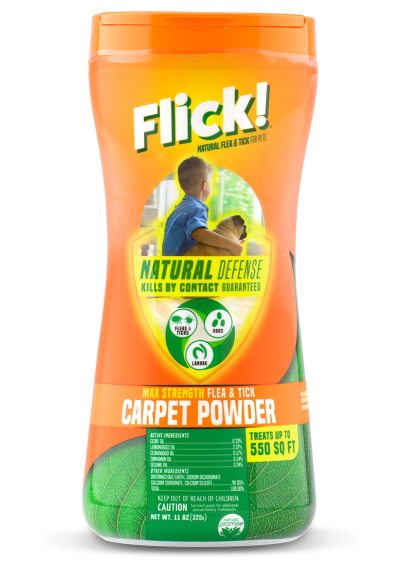 Flea & Tick Carpet Powder can be used directly on dogs over 12 weeks. Apply lightly over the entire body, including the ears and tail. Rub powder into hair and around feet. Do not put powder in dog’s eyes, nose, or mouth. Will not interfere with other spot-on products. Us as often as needed.